Cheers Eagle, adding to this review now occasionally, is as much for me now, although I hope the odd person enjoys it. 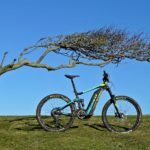 I like reading reviews of other bikes but often think that although initial thoughts are useful many are done too soon and you need to live with a bike a bit and put some miles on it to gain a real perspective on its good and sometimes bad points. 10.000 miles feels like a milestone on my Haibike Yamaha commuting to work odyssey. As of my return trip from work last night I have covered 9954 miles with 3954 on the new motor. I return to work on Friday and will be comfortably over 10,000 miles by the 22nd of September when the bike will be three and a half years old. The previous motor was replaced under warranty at 6000 miles just after two years use. There was nothing wrong with the functionality of that motor but the main bearing had developed play and a replacement motor seemed to be an easier course of action for the manufacturer than replacing the bearing that had worn. I cannot say I was unhappy to get a brand new motor free of charge. When inevitably the bearing on my replacement motor develops play in the main bearing it will be interesting to see what options my dealer will be able to offer me. I know that they replace worn out bearings on Bosch motors. Hopefully by then they will be able to change the bearing for me or provide me with the correct bearing I can change myself. Perhaps there might be some kind of motor exchange deal. Maybe they will only be able to offer a replacement new motor and I will have to find out myself how to change the bearing or bite the bullet on a new motor dependent on cost. Top gear (12 tooth sprocket) started to jump under load a couple of times on the way home last night 10/09/2018 so I will be putting a new cassette and chain on before my next ride to work on Friday 14th September. I will not change the front Garbaruk 42 tooth narrow wide chain ring as it is still has plenty of life left. I use KMC chains and cheap Shimano 9 speed cassettes. This cassette, chain, and chain ring came into service on the 27th of February 2018 and together have completed 1462 miles in just under six months. The narrow wide chain ring was my first experience of one and I have found it to be absolutely superb and would highly recommend them and this one in particular. No dropped chain since I put it on and beautifully engineered to be light and strong. Over half the miles I do are off road in a sandy area which increases the wear rate of the chain, chain ring and rear cassette. With the best will in the world regular commuting means that the transmission does not get cleaned as often as it should as you just run out of time and energy to wash the transmission off before having to head off to work. Also it is my trip to work that is off road and gets everything dirty so that the transmission is dirty before my 10 mile road trip home. My rear rack support leg fastening on one side broke and I salvaged a rack I had fitted to a Marin Bobcat trail hard tail mountain bike that has been sitting unused in my garage. The old rack had lasted just shy of two years which I think was OK considering the battering it got off road loaded with two Ortleib panniers. The new one looks much better with the support legs closer fitting to the frame and therefore held more securely. The rack has already had a hard life fitted to my Marin, but I hope to get a lot more use out of it now it is fitted to the Haibike. My tyres have now covered 4400 miles since I put them on, on 5th January 2017. They are Specialized Crossroads Armadillo 650B 27.6” Wired Clincher Tyres in 1.9” width. They are very tough and look like they can last still longer. More wear apparent on the rear than the front as you would expect. Fantastic protection and no punctures. When the rear needs replacing I will move the front tyre to the rear and put a new tyre on the front. They are a classic compromise and more road orientated than I would like but with the miles I do on the road mountain bike tyres would wear out in no time and after getting used to them I have learnt that they are more effective than I had first thought they would be off road. Fortunately with the help of a handy mate we were able to replace the connectors with generic ones bought off Ebay for less than a tenner. In order to do the job properly we did have to open the battery case but it all worked as before after we had put it back together. The battery has powered the bike for 1022 miles since the connectors needed mending. The new cheap Ebay connectors are a bit chunky and remind me of chock block connectors but are easier to use than the original ones and have been completely reliable so far. Perhaps just as important is that I now know that they can be relatively easily changed if the need arises. The battery which is the original one and now itself three and a half years old continues to work really well with still little obvious sign of a loss in capacity. 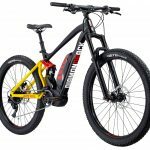 On my 14 mile mostly off road ride to work on Monday it used 28% of its 400Wh capacity and 36% on the 10 mile road trip home. I use more battery going home as I use the motor more to travel faster and complete the journey in around 30 minutes to aim to achieve an average speed of around 20mph. Perhaps in the forthcoming cold of winter I will begin to see some sign of the capacity reducing. Time and cold weather will reveal all. The fact that the battery can be removed so easily and that I always do remove it and keep it in the house where it is warmer and dryer than a cold garage may be a factor in keeping it in good condition. After my ride home my battery is about 65% fully charged and is left like this until as near to the next time I intend to use the bike as possible before being charged up to full. If I am on holiday from work the battery is left until I next go back to work and this gap can be up to three weeks. The Tektro brakes just require brake pads as and when and continue to work really well with no fuss or other more major adjustment. My first rear light was a Moon Comet which was good but failed inside my first year of ownership and Martin at the e-bikeshop where I bought my bike and the light replaced the Moon Comet with the updated Moon Comet MKII free of charge. Great customer service. So after 3 and a half years now and 10,000 miles I am still very impressed with this bike. I continue to find the Haibike frame and Japanese motor a great quality combination. I bought a crank drive bike to enable me to ride mostly off road to work using in places quite demanding single track routes while carrying panniers on a rear rack and then having the ability to morph into a fast road bike to get me 10 miles home quickly. I still find riding this bike is amazing fun and also get the benefit of plenty of exercise in the process. I will be 57 soon and plan to retire when I am 60. Will this bike last till then? That would be pushing the mileage up towards 20,000 miles based on my usage so far. How much longer will this original battery last? Will the main bearing in this second warranty replacement motor develop play like the first motor or will it go further or not as far? Will there be an option to have the bearing replaced? 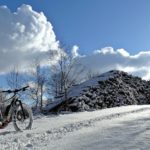 Will I just want a different bike at some point? Will my knees hold out? They certainly ache and creak more than they used to. Time will reveal all but I am really enjoying riding this bike to work and back and the freedom from driving a car. Hi argoose, yes I have seen this and it is good to have some options to repair and overhaul an older motor rather than having to buy a new one or bike.